We’re proud of GenCanna’s continued expansion and success, as the industrial hemp research pilot program continues to grow. On the first day of Hemp History Week, GenCanna Global Inc.™, a worldwide leader in hemp cultivation, manufacturing, and hemp-derived products, celebrated their continued growth and expansion with the official opening of a new office facility in Winchester, KY. A milestone for the company’s development, the extension re-affirms the value added to the community by GenCanna’s 100+ jobs created and $50m in economic impact in the state over the last 4+ years. The new building on Venable Road serves as GenCanna’s corporate headquarters, while the Hemp Research Campus on Colby Road remains the flagship and home to the hemp processing, extraction, and product development in its FDA Registered and Inspected facilities. 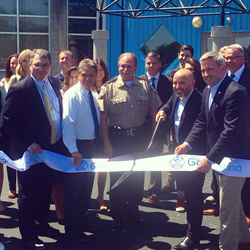 “We're thrilled that our mission in Kentucky continues to grow and expand,” said GenCanna™ CEO Matty Mangone-Miranda, “The opening of the new corporate headquarters in Winchester is an example of GenCanna's steadfast commitment to social, economic, and environmental responsibility as we deliver our industry leading hemp-derived products and bring more jobs and resources into the Bluegrass State. We are pleased to be adding local Sales and Marketing, Finance, and Corporate Services professionals to complement our Production and Laboratory divisions."